These Bougainvilleas make a beautiful splash of colour against the green trees in St Georges Park. Looks more like spring than winter. This old school building is one of PEs landmarks. Whenever you want to give directions in this area, you just have to say "do you know the Old Erica Building" and 90% of the time, the answer will be yes. It was built in 1903, and housed the Erica School for girls. 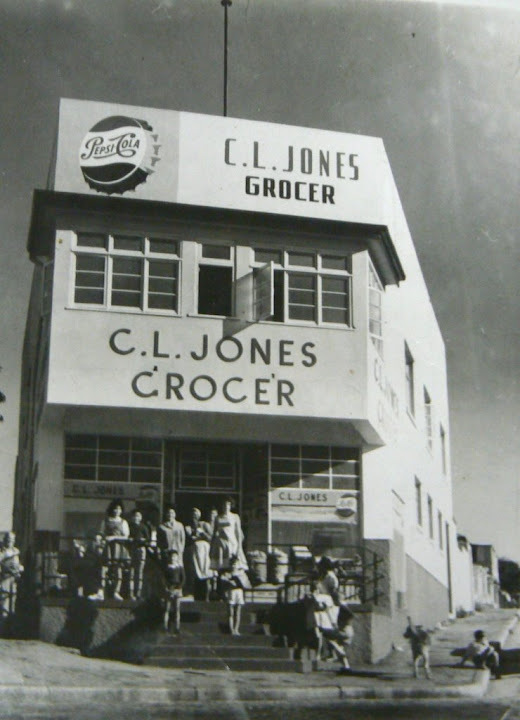 When they outgrew it and moved across Albany Road to their new home in Mount Croix, it served many purposes, and currently houses the Art School of the Port Elizabeth College. As it perches on the edge of a cliff, it commands wonderful panoramic views of Algoa Bay, so I would imagine it is a pretty inspiring environment for the art students to work in. Below the cliff, stretching out to the left of the photo, is North End, a mixed area of old residences and commercial and light industrial properties. Looking towards the sea from the freeway, on a wintery day last week, the dunes at the Swartkops River mouth can be seen, with the houses of Bluewater Bay stretching Eastwards along the coast. To the left, inland from the bridge, is another view of Amsterdamhoek. This is an idyllic spot, as long as the wind is not blowing from the direction of Smelly Creek! Yesterday we saw the "nice" side of the Swartkops river. Today we see the West bank, which is low and flat, forming a marshy wetland. The riverbank on this side is known to locals as "smelly creek". It is home to the Carbon Black factory, (to the left of the picture) and right next to that is the sewerage reclaimation works, (on the right of the photo) so the name is not unjustified. Generations of PE families have driven past here and said "that wasn't me!!!" as the aroma wafted into the car. Well this is one way to cruise the coast in style. This shot was taken at Schoenmakerskop, looking towards the Maitland River Mouth and Beach View. Most of our visits to other sky watch posts will be as either Suzi-k or Max-e.
Visit Tom at Wiggers World for more Sky Watch pictures. Continuing our look at PE's eclectic skyline, from the same viewpoint as yesterday's photo, but a bit to the West, you see another iconic landmark which we have featured before, the Donkin Reserve, with its lighthouse and pyramid. You also see a mixture of some of the earliest residences in town, mixed with more modern (30s to 60s) blocks of flats. In the far background, the ugly new post office building, (which blocks many potentially sweeping views of the bay from Richmond Hill!) on the old Main Street, now called Govan Mbeki Ave, which runs parallel to the coast. To the right is the main Roman Catholic Cathedral in town, St Augustines, and the peach coloured gable wall to the left of that, with white trim, belongs to the old Opera House. The curved stone gable wall in front of the cathedral is part of the Feathermarket Hall where auctions of ostrich feathers were held in the early days. One of the things we love about Port Elizabeth is that she has some fascinating eclectic skylines. There are interesting viewpoints around the city where you get to see such a mixture of the elements that make up this town. Standing on a hill in south End, overlooking the ruins of St Peters Church (a reminder of the injustices of our Apartheid past) we see the bay sweeping around in the background, with a bustling modern harbour. And in front of it, we see a mixture of some of our earliest and most prominent buildings (like the City Hall and the Old Post Office) offset by some of the ugly oxo cubes that were a feature of 60s and 70s town planning. To the right is the Campanile which we featured in detail recently, now dwarfed by the Settlers freeway. Below the writing which says Baakens street, one of the very earliest roads in town, are a set of zig-zag rooftops. These are from the original old boat sheds that were on the beach at the river mouth. All the land to the right of that, including the harbour, has been reclaimed. The line of trees in the foreground, behind the ruins, shows the position of the Baakens River Valley. We will shortly do a series on the Baakens River as it appears in different parts of town. Even in winter, the Kikuyu grass in Richmond Park, and many others around the city, remains green and needs mowing, although it is certainly not as rampant as it is in summer. The Municipality has outsourced the mowing of the parks to private companies run, according to the latest PC Speak, by PDs, as part of its BEE initiative. I could write a book about how irritating I find acronyms, and when you get into the international realm of blogland, they multiply hideously as each country has its own set of acronyms that mean completely different things to the same set of letters elsewhere. So to translate, "this is Politically Correct speak for using Previously Disadvantaged (black owned) companies, as part of the Black Economic Empowerment initiative." Often this AA (no, not Automobile Association or Alcoholics Anonymous, but Affirmative Action!!) system gets abused and a few fat cats get richer and richer, while the average person remains disadvantaged. But in this case, it is really cool that small businessmen are being given opportunities to get contracts, invest in machinery, grow their business, and provide employment for others. For many, sweeping up grass cuttings might not seem the most desirable job, but for this lady, it is an opportunity she would not have had 15 years ago, to help provide for her family. While many people were enjoying a sleep in on Moday, 16 June, which was Youth Day others were up bright and early to go fishing from New Brighton Pier. This is Govan Mbeki Avenue (named after the father of our current State President) which used to be called Main Street. In fact, long before that, it was divided into 3 sections and the bit between the Town Hall and the bottom of Russell Road was called Queen Street. From Russell Road to Albany Road it was called Princes Street, and from Albany Road to the fork where it became the Grahamston Road, it was called Adderley Street. High rise municipal and Government buildings were put up in the 70s and 80s. To the left is the Eric Tindale building which houses the municipal offices, and the one which stands on the bend in the road, so it looks as if it is in the middle is the Main Post Office building. Unfortunately many were built at a time when architecture was not very inspired, to me a lot of them look like giant oxo cubes! To the righ, next to the modern high rise, is one of the original old buildings from the early years of PE's development. These cool ethnic style kaftans and traditional shirts are also at the Boardwalk Craft Village. More traditional crafts, this time beadwork with a modern twist... at the Boardwalk Craft Village. Traditional basket work on sale at the craft village in the Boardwalk complex. A water pipe burst in Albany Road (one of our main arterial routes leading to the sea) last week. Apparently it created a stir in the early morning traffic. By the time I got there an hour later, the Municipal workers were hard at work trying to sort it out. It seems to have undermined the subsurface under the tar, and later in the day a truck sank into the hole and ended up with its tail in the air (a bit of a bummer for the driver, hehe). The bright white patch you see in the background is the sea, the sun was still low and glancing off the water in a dazzling glow. Sunrise over the Russell Road Cemetary, Richmond Hill. Port Elizabeth airport is not the biggest on the planet, and although it has had a few upgrades over the years, it is still basically a small town airport. The runway is not long enough for the jumbo jets and the new airbusses, so traffic is automatically limited to smaller volumes on each flight. Although there has been talk for many years about lengthening the runway, nothing has materialised yet. But it suits us. If I had to choose between the parochial airport here, with parking space within easy distance from the building, or the insanity of O.R. Thambo in Johannesburg, with its never ending upgrades and mind-boggling queues and parking issues, I'd go with this any day! On the left, you can see the South African flag, and on the right the radar tower. While we are on the subject of 34 degrees South, we might as well go and have a look around inside.... interesting industrial look ,well stocked pub, custom painted table cloths, great food and a huge stock of wines and other drinks, sushi and sashimi, deli goods, baked treats, imported luxury foods, ample outdoor seating for good weather, and wrap around glass walls and doors with a view across the lake, and live jazz on most weekends.... what a winner! We have featured 34 degrees South before. It is one of our favourite restaurants, with a great deli and one of the widest ranges of seafood and Mediterranean dishes anywhere. This sign amused us, although I must admit it could well be the motto of the dictators in some of our neighbouring states! 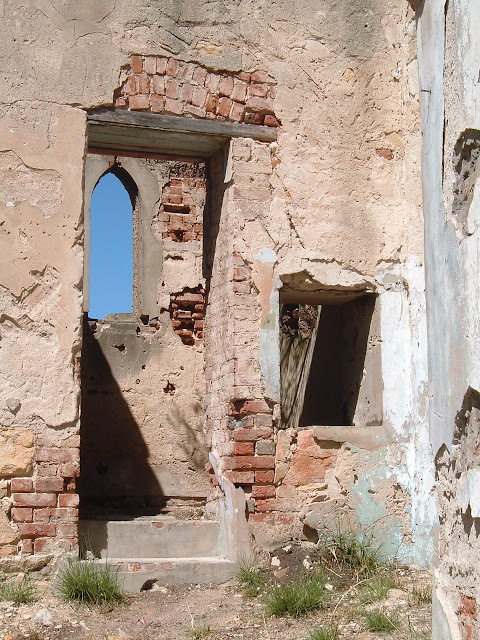 We have posted about South End before, it is one of the areas that were cleared out during the Apartheid era, because of the racialy mixed community, and this church was later demolished because the congregation kept returning here to worship. It remains as a necessary reminder of a shameful part of our history that will hopefully never be repeated! Those of you who have been to PE and been away for a while would be gobsmacked to see how fast the city is growing. Remember the big open space along Buffelsfontein Road, between 10th Ave Walmer and Miramar and Mount Pleasant on the outskirts? Well it is musrooming into a ribbon of townhouse complexes and retail outlets, and has become so built up that the road is being widened into 4 lanes! This is part of the section between Walmer Heights and the end of William Moffat. Here is another aerial view of the lighthouse, taken when our son took us flying a couple of years ago, to look for whales. You can see some of the rocky reefs jutting into the sea. Here is another view of the Cape Recife Lighthouse. You can read more about it in the previous 2 posts. Yesterday we showed you Cape Recife. There are some trecherous reefs on the rocky coastline at this point, including the infamous Thunderbolt reef, so named because it claimed the HMS Thunderbolt in 1847. It was realised that a lighthouse was needed here, and so the Cape Recife lighthouse was built and commissioned on 1 April 1851. It is 24 meter masonry tower, painted with distinctive black and white bands. MV Pati, a Cyprian vessel, laden with a cargo of cement, on route from the Ivory Coast to the Persian Gulf. She struck Thunderbolt reef in March 1976, sinking to form a colourful artificial reef, teeming with fish and interesting artefacts. The Itzehoe (1911), a German vessel which still has plates, dolls, moustache cups, pianos and other interesting artefacts. SS Fidela, a brand new Steel Screw-Steamer, commissioned as a mail ship between Australia and New Zealand, but never made it to Australia, sinking after striking a reef in the Cape recife area on the 7th April 1873. She lies about 400 metres from the shoreline. During World War 2, practice bombs made of concrete were dropped on her. These can still be seen at the site. MV Kapodiatrias (1985), a Greek bulk carrier conveying Manganese ore, Zirconium sand, Rutile and Sugar. She struck a reef and sank without loss of life involved. 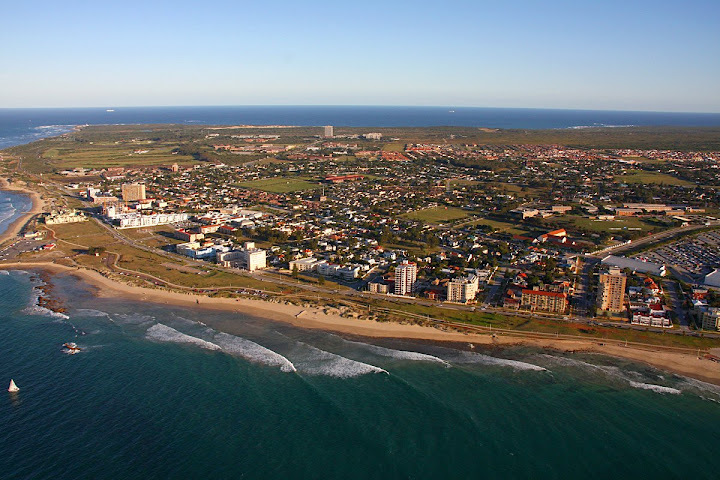 If you look at a map or Google Earth image of Port Elizabeth, you will see that it is built in the curve of a sweeping bay, so that, even though you are on the Southern edge of Africa, and would expect to be facing Antarctica when you are on the beachfront, you are, in fact, facing North! The point of this bay, before the coast again swings into an East-West direction, is called Cape Recife. In this aerial photo of the recent GIZA Challenge Regatta held by the Algoa Bay Yacht Club (who kindly supplied this picture) you can see the Cape in the distance, (top left) and if you look closely, you can see the lighthouse. More about that tomorrow. A group of local artists get together each week for a bit of plein air painting (painting in the open, on the spot, rather than from photos). This morning we went to a dairy farm along Kragga Kamma Road, on the outskirts of town, and painted the dam, and beautiful spotted local cattle called Ngunis. It was great to be part of this group, a good mixture of fun, sharing skills and being productive, not to mention the pure joy of a morning out in the country. At the entrance to the Boardwalk Casino is a fountain, and it doubles up as a wishing well. This little guy just kept wanting to throw coins in... (a bit like the adults inside at the slot machines hehe) hope it's not a sign of things to come! This little cafe, round the corner from our house, is one of that dying breed of old fashioned family stores, which sell everything. You can't imagine how it all fits into the small space, but no matter what obscure item you ask for (enamelled coffee cup, paraffin lamp, fishing tackle, you name it) they seem to have it in stock. It is in Richmond Hill, and as you can see from the architecture, was built some time in the 1930s. It literally is a corner store, built on a narrow triangular plot at the intersection where two streets run down the hill into another. So it is on the corner of 3 streets! It is still owned by members of the original Chinese family who started it. Last year the owner gave me copies of two treasured old family photos, which were taken in 1960. As you can see, aside from the Pepsi sign on the top, it has barely changed after all these years. 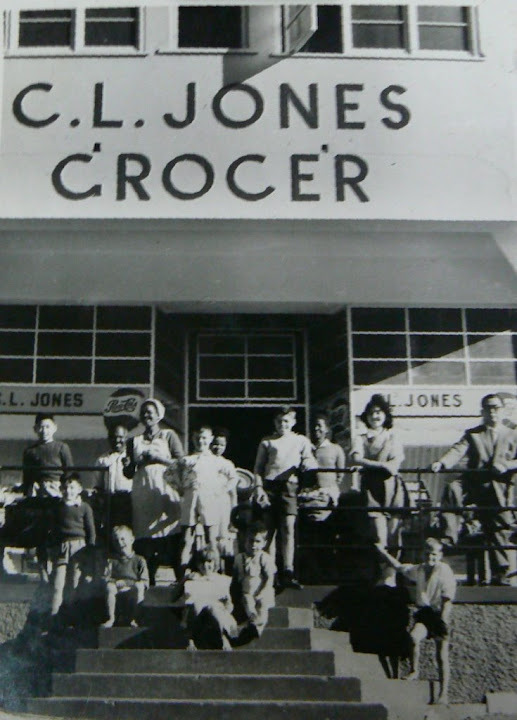 This one shows the whole family of the current owners (the man on the right was her father-in-law who owned the shop then, and the girl next to him was still at school then and is now 61! Many other Cities around the world are participating in this theme day.